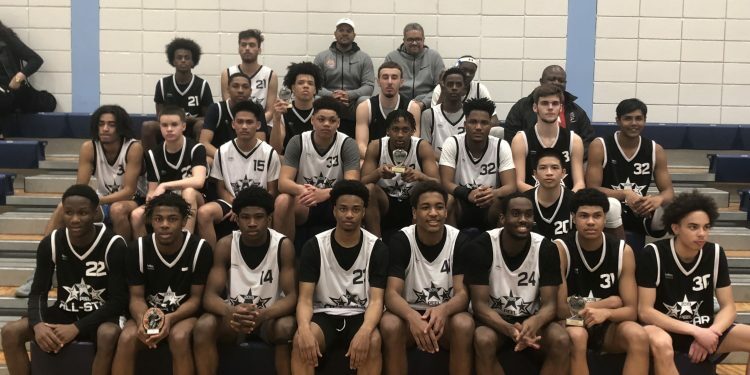 Last night some of the best the region of Peel had to offer put on a show, in both the Junior and Senior ROPSSAA All Star games at Sheridan College’s Davis campus in Brampton. The first matchup pitted the juniors team black vs team white, where it managed to be a competitive game right down to the wire, with team white leading 50-43 at half. The game had a number of highlights, such as a nifty layup in traffic by Olu Nwoko of St. Joseph S.S., some impressive ballhandling from Jayden Williams of St. Thomas Aquinas. Not to be lost was the big man Ose Okosie of d’Youville, who showed off his high flying skills with a couple of dunks and finishes through contact. But the night would belong to c/o 2022 Emmanuel Lawal from St. Martin’s and c/o 2022 Deji Ajayi from St. Edmund Campion, who took home MVP honours as team white would get the 82-77 win. Lawal had 14 points for team white, while Ajayi had 17 for team black. Up next was the senior game, which would also prove to be a close contest. Some of the top ballers in Peel showed out for this game, including Humber College commit Justus Salmon of St. Francis Xavier, and Team Canada member DJ Jackson of St. Martin. Despite it being an All-Star game, both teams showed a lot of cohesion in the first half, with some great ball movement that resulted in open looks for the majority of the offence on both sides. The player whose stock rose the most last night most definitely had to be Filipe Vau from Philip Pocock. The undersized guard showed off his IQ with a number of dazzling passes when splitting the defence, while managing at one point to knock down 4 straight threes to keep team black in the lead in the second half. When it was all said and done, team black would indeed hold on to the 112-101 win. Lear Watson of Notre Dame (Brampton), and Kevonte Marksman of Brampton Centennial would take co-MVP honours for each of their teams. Other awards that were handed out include Underclassmen of the Year that went to DJ Jackson. Tyrell Vickers of St. Francis Xavier managed to win Academic Player of the Year, while the honour of “Mr. Peel” for MVP of the regular season went to Shy Grant of Brampton Centennial. Peel players that are interested in continuing to increase their exposure for college scouts should be sure to sign up for the NPH Showcase Circuit, that will be making a stop in Toronto on June 22nd and 23rd.